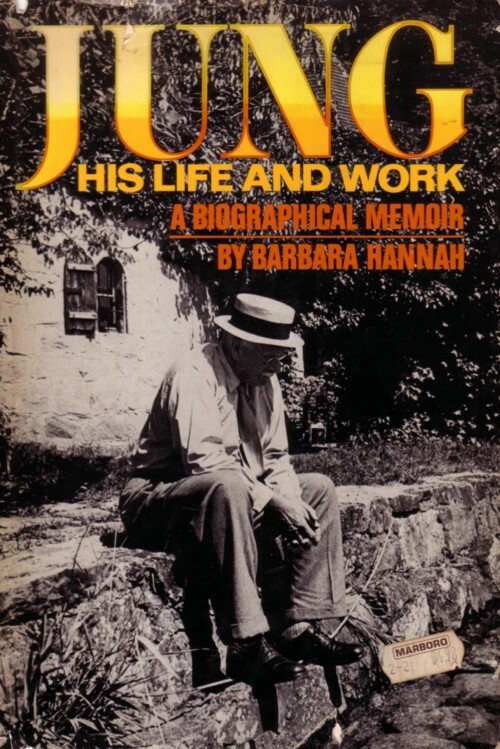 It is an biography on Carl Gustav Jung, written by Barbara Hannah, who was a student of him. I knew not very much of the life and work of Jung, and although I am only halfway, I was fascinated from the beginning of this book. 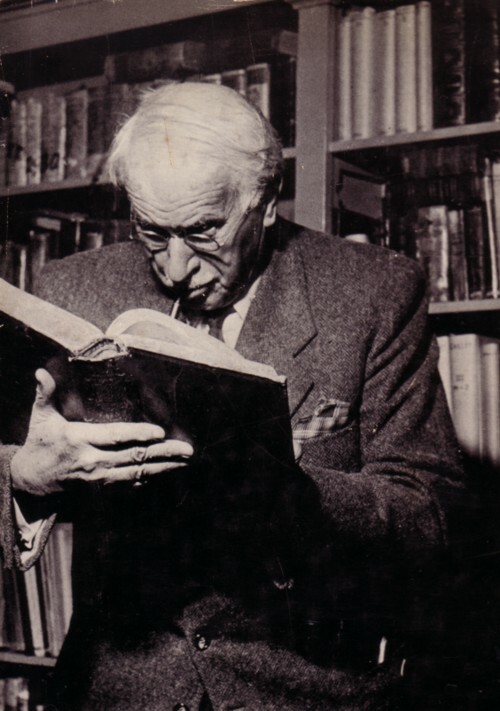 Jung should be in my top ten, together with people like Gurdijeff, Ouspensky, Steiner, Crowley and McKenna. In our culture the inner world is usually not regarded as real. And if people do see the inner realm as real, they usually don’t see it very clearly or translate their insights into words that seem nonsense to me. I have read hundreds of books on the inner realms and I think that only a few are worth remembering. 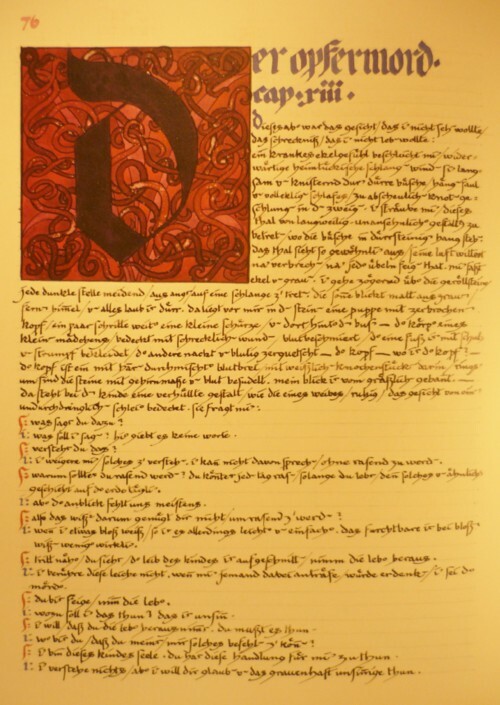 When I did a Google search on Carl Gustav Jung I found out that in 2009 a strange book was published, called ”The red book” . Until it was published last year only a handful of people had seen it, because the Jung family didn’t want to have this material published. I have only seen pages on the Net, and the book (published as a facsimile) costs 155 euro, which is a bit beyond my budget. (I guess that there will be a cheaper edition available in time and I am not in a hurry.) 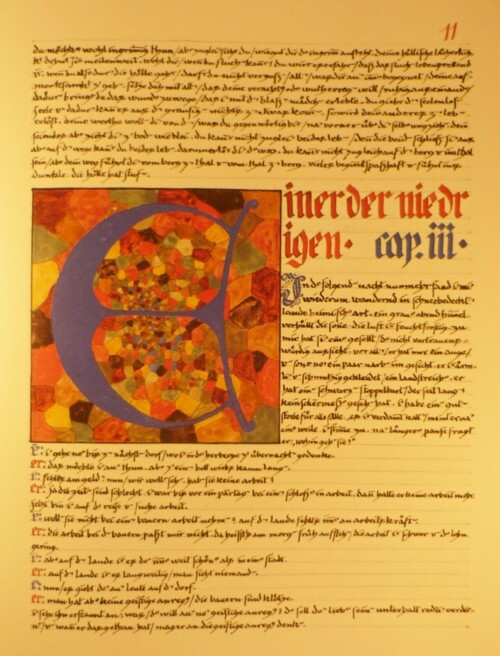 Jung himself called the manuscript ”Liber novus” . 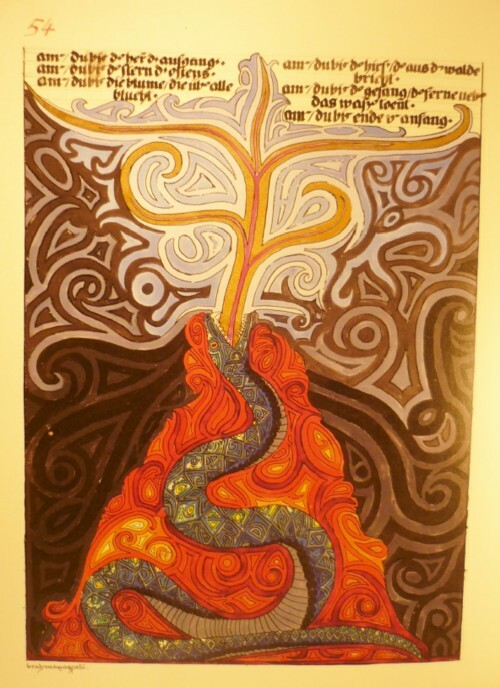 It is a alchemistic diary, an exploration of the deeper layers of his psyche. The same layers where many people, like Adolf Wolfli, got lost l and stuck. 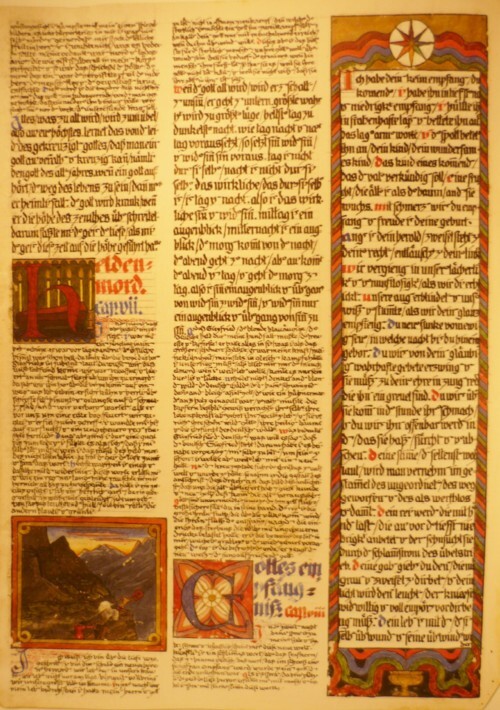 For anybody who has ever explored the inner realms these pages will be very familiar, even if you don’t read the text. As I see it, all art, all ideas, all inventions and all dreams are products of something that is Life itself. It lives both inside us and outside us: it literally is everything there is. What is called the ego or personality is actually a defense against the overload of Life, which is constantly flooding our system both from the inside and outside. Such a defense mechanism would not be a problem if there was no identification with this ego/prisonality. In our culture most people seem to think that they ARE their defense mechanism against Life, which obviously can never be true, of course. But it is better to read Jung or Ouspensky on these matters, I am only trying to summarise what they say, and they say it much better. 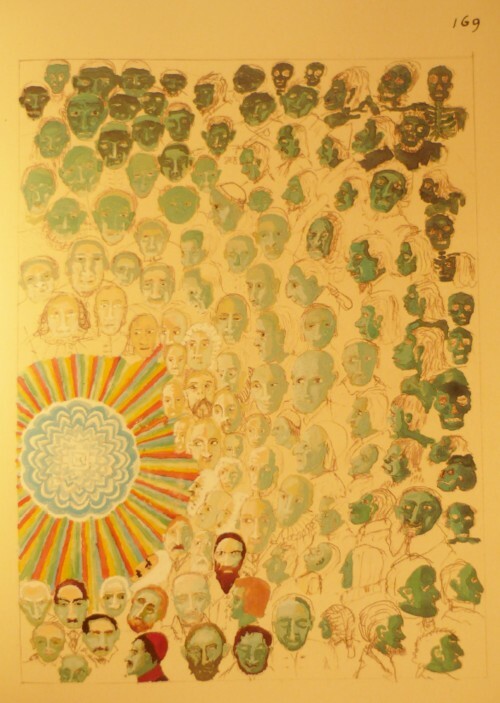 Jung made notes of every single step along his way in getting to grips with his ego, Life and their relation. Obviously, these writings are full of guessings, wrong theories and wrong interpretations. But diaries like these are maps of the mind and extremely helpful for others like me, who try to find their way in the inner realms too. 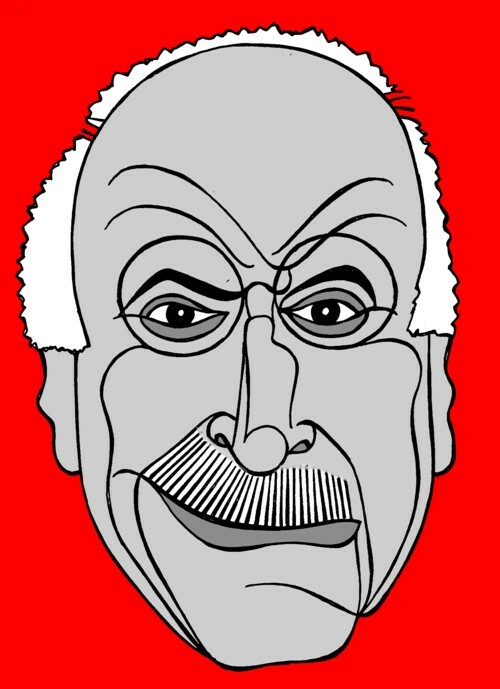 What good are the conclusions that people like Jung made at the end of his journey if I don’t know how he came at them? 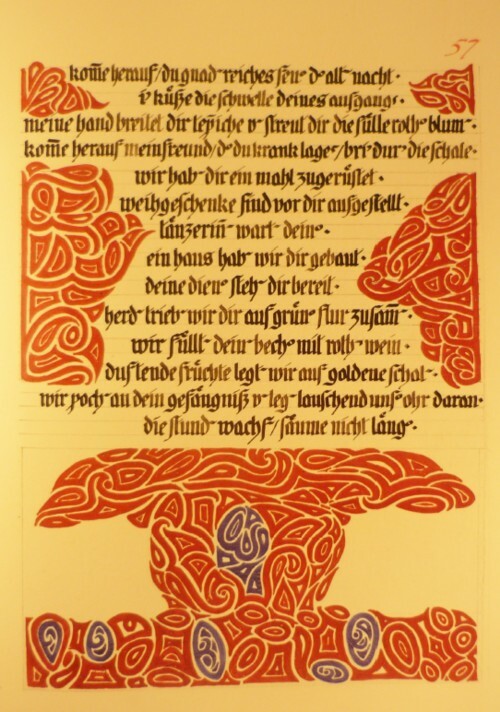 As I understand it, Carl Gustav Jung tried to make a map of his own psyche, so that he could describe a way for everybody to find God within her/himself. Most of the people who tried this, came up with maps that look like the works of Adolf Wolfli. 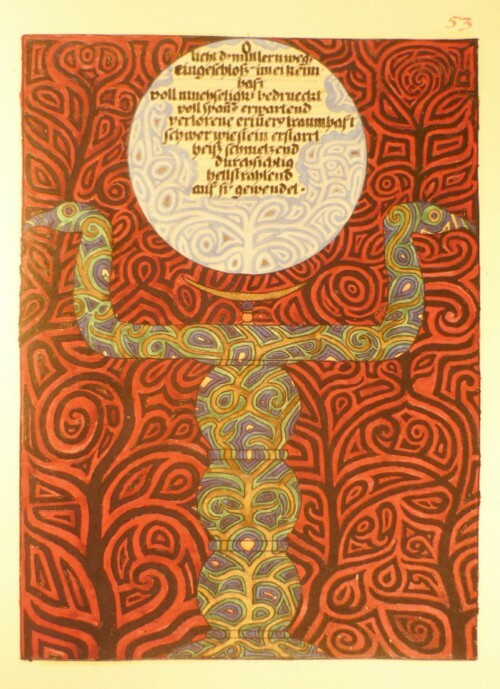 I don’t know how many people found God within themselves with the help of the work of Jung. There are unfortunately no statistics for this.